Happy New Year! I hope your holidays were happy…I know mine were and they went by very fast. They always do. Christmas is always a wonderful time of year to connect with family and friends to reflect on the year that was and to ring in the New Year. 2014 is going to be another great year! Our Annual General Meeting in November turned out to be a wonderful evening. The food was amazing and everyone seemed to be having a good time, especially when Santa showed up. The Penny sale was a huge success so we plan on having more of those during the year along with the Ways & Means draws. The winners of the 4 categories in the photography contest were Winter: Gwen VanNatter, Spring: Marilyn Stavinga, Summer: Maura Cooper, and Fall: Donna Cavers. Start taking pictures now with the contest in mind and plan on entering your photos when we have it again in the fall. The prizes are well worth it. Your 2014 executive and directors were sworn in: President: Lori Maracle, Vice President: Debbie Thomas, Secretary: Sue Mazi, Treasurer: Kim Christoff and your directors are: Betty Ballanger, Pauline Bradford, Maura Cooper, Mary Lou Johnston, Vel LeVatte, Rob Maracle, Marilyn Stavinga, and Ian Steel. We have a strong group working for us again this year……the sky’s the limit!! We will have our usual events this year such as the Home & Garden show, the May plant sale, our June garden walk, Trillium awards and our photography contest. At the risk of sounding like a broken record please remember that volunteers are needed in order for these functions to take place. We need help with every aspect of the society: planting, meetings, events, and fundraising. The executive and directors work very hard planning our monthly meetings and events but they need volunteers from the members to help with various jobs and projects. We need 3 volunteers to help Maura with the kitchen duties at each general meeting. This usually entails bringing some goodies and helping in the kitchen. It’s not a huge commitment and everyone looks forward to the goodies and refreshments. The Home & Garden Show, the Plant sale and especially the planting of Dunnville’s town flowerbeds require a lot of manpower so please plan on helping out. Many hands make light work. Some of our sponsors make sure that we are well fed when we are working so hard; that’s definitely a perk! We will continue our partnerships with the Dunnville Secondary School, Dunnville BIA, Chamber of Commerce, and the Dunnville Rotary Club. We are joining forces with the Rotary Club this year to lend our assistance with a facelift for Muddy the Mudcat. The Rotary Club is in charge of the area where Muddy sits and they need our expertise in helping them pick out plants and grasses to put in around the base of the statue. Muddy is going to look amazing! I’m not too sure what’s happening regarding this year’s bus trip, but I do believe there is a trip in the works to Whistling Gardens and Bonnie Heath Lavender Farm. These two facilities are located fairly close to each other and it will make for an exciting day! 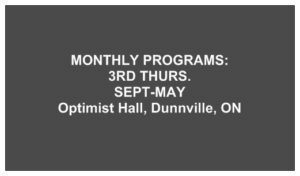 Our general meetings will be held at the Optimist Hall again this year on the third Thursday of each month except April which will be on the 4th Thursday (April 24th). Meetings start at 7:00 p.m. Our first meeting of the year is Thursday January 16th and we will be having a question and answer session with some garden experts. Bring your best gardening questions! Membership fees will remain the same as last year: $10 pp, and $15 per family. We are having our early bird membership draw again. Have your membership purchased by the February meeting to be in the running for a really cool prize! Be sure to check our website periodically for updates such as speakers/meeting topics, upcoming events and news. We will continue to email newsletters, minutes and upcoming events before each meeting so be sure to check your junk mail if you aren’t receiving them. And, of course, we will still have them printed for the meetings along with our colourful agendas. Surveys were handed out at the last general meeting. We got some great feedback and all the comments and suggestions have been taken into careful consideration. Thank you to all the members who took the time to fill them out and hand them in. Garden tip of the Month: Stay inside where it’s warm!!! Can you believe these ridiculous temperatures? This is a good time to sit and plan your garden on paper, or tend to your houseplants that may need repotting. Closely inspect them for aphids which can be treated with a mixture of equal parts of rubbing alcohol and water and an added drop of dishwashing detergent. Apply this to infected plants with a soft brush. Provide extra protection to your houseplants on windowsills if it’s very cold outside. Be sure they don’t touch the windowpanes. Provide some protection by placing a piece of cardboard between the plant and the glass. Remember to keep your bird feeders full and if possible supply fresh water for the birds. Nuthatches, chickadees, cardinals and juncos love bread scraps as well. Keep warm….see you at the next meeting! The meeting was opened by Debbie Thomas at 7:00 p.m. There were 45 people signed in. Debbie welcomed everyone and gave a brief review of our highlights from 2013 emphasizing the importance of the membership and the beauty of the gardens. Kim went over the minutes from October 2013 and talked about having the minutes emailed prior to the meeting. Also, in future they will be projected on the wall as well as posted at the back of the room. Printed copies will be available on request. Linda Muldoon moved to accept the minutes and it was seconded by Karen Waltham. The motion was carried. The treasurer’s report from December was read. MANDATORY FIRE DRILL was held. All doors were covered. Refreshments were put out, including a birthday cake for Maura Cooper, baked by Marilyn Stavinga. Debbie went over the 2014 agenda, highlighting events and speakers. New agendas will be printed now that the dates and names of speakers have been confirmed. Debbie also told the membership about our hope for a tree planting program for the town of Dunnville, our partnership with Dunnville Secondary School, our involvement with the Rotary Club and Muddy Mud Cat, the survey results (see attached) and the on-going meetings for the new parkland. We held a Q&A session with a panel of garden experts from our own membership. Marlene Link, Beth Powell, Pauline Bradford and Judy Jeffery did an excellent job in giving answers and advice. Other members gave answers too. It was a fun and very informative session. Thanks ladies! We held the Ways & Means draw which raised $61.